A recent article in Castanea explores a study conducted by researchers on the Abrams Creek Wetlands. In the study, they examined the natural ecosystem and the ecological value of the wetland. This study and its publication come at a critical time for the Abrams Creek Wetlands. No other limestone-based wetland in the state has as many rare plant species. Castanea— Natural wetlands provide safe haven for birds, support rare native plants and contain natural ecosystems that can only exist in fens, swamps and marshes. However, wetlands are regularly threatened by road, housing and farmland development. Determining the ecological value of a wetland—and deciding whether to protect it—often requires a thorough inventory and an examination of its supported species. The authors of a study published in the current issue of Castanea inventoried the Abrams Creek Wetlands in northwestern Virginia’s Shenandoah Valley. The researchers examined what was currently responsible for the makeup and interactions of the Abrams Creek Wetlands natural communities and documented what could be lost if conservation did not accompany future development of the area. The Abrams Creek Wetlands is surrounded by houses and farms, yet it retains its ecological significance, attracting birders and other naturalists. With soils that remain extremely high in calcium, it gives modern researchers an indication of the original ecology of the stream-valley wetlands in the area. Half of the wetlands have been designated as a preserve, and conservation efforts have elicited promises that the other half will be separated by a 50-foot buffer from the road with housing construction scheduled to begin in 2018. The researchers found 304 species in the 24-hectare Abrams Creek Wetlands; 71 percent of which are native to Virginia. Those native species cover 72–99 percent of the marshes, fens and swamps that make up the wetlands. Of those native species, 20 are listed as rare in the state. The highly calcareous soils of the Abrams Creek Wetlands, and those like it in the Ridge and Valley Province, support these native species; some of which are rare not just statewide but globally, even as they are divided and isolated by continuing human construction. 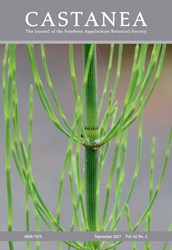 Full text of the article “Floristics of the Abrams Creek Wetlands, a Calcareous Fen Complex in Winchester City and Frederick County, Virginia” in Castanea, Volume 82, Issue 2, 2017, is now available at http://castaneajournal.org/doi/full/10.2179/17-137. Castanea is the journal of the Southern Appalachian Botanical Society and publishes articles relating to all aspects of botany in the entire eastern United States and adjoining areas. The Southern Appalachians—the nonglaciated, mountainous areas of Alabama, Georgia, South Carolina, North Carolina, Tennessee, Kentucky, Virginia, West Virginia, Maryland, Pennsylvania, and southwestern New York—form an evolutionary center for native plant diversity for the northern temperate regions of the world. The society dates to 1935 and serves all persons interested in the botany of the Southern Appalachian Mountains. The journal encourages submissions of scientific papers dealing with basic research in any field of plant biology, systematics, floristics, ecology, physiology, and biochemistry. For more information about the journal or the society, please visit: http://www.castaneajournal.org/ or [http://www.sabs.appstate.edu.